Image: Harry Potter, Warner Bros.
Buzzfeed did the math and, assuming that all the houses have roughly equal numbers of students, there would need to be an average of 35 students per house per year for there to be 1,000 students total. (1000/7 (the number of years at the school) = 143 143/4 (the number of houses) ≈ 35). However, the movies appear to show only 18 kids in Harry’s Gryffindor year. And it doesn’t look like there’s an explosion in the other houses to make up for that. Since Harry was just a little over one year old when Voldemort was defeated the first time, we can assume that his year, the year right below him, and the years above him would all be relatively small, as it was effectively wartime in the wizarding world. Not a good time to have babies! But any years after that might be unusually large, due to a post-war baby boom like we saw after World War II. Which could smooth the numbers out and mean that, by book three or four, Hogwarts was back up to the usual 1,000 students. This theory can be further expanded to include the epilogue to the series, which takes place 19 years after the Battle of Hogwarts. In the epilogue we see Teddy Lupin—like Harry, born during the end of a war with Voldemort, and likely also part of a tiny class. 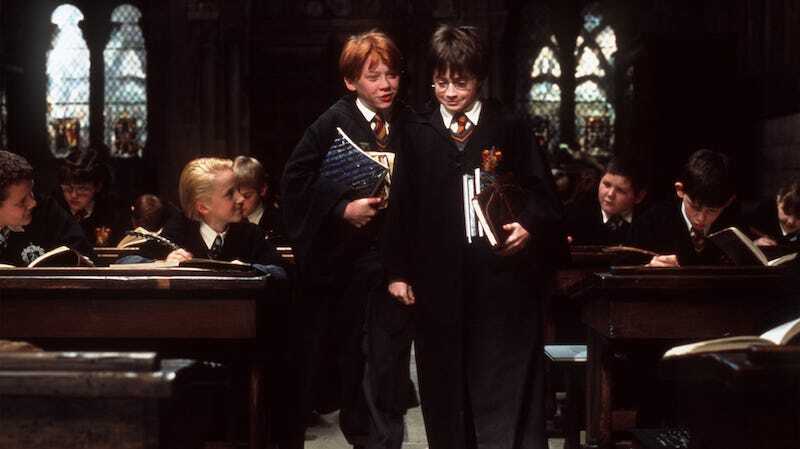 James, Harry’s oldest son is already at the school by then, and his class might very well be a giant boom class. Basically, we’ll know the wizarding world has finally returned to normal when the class sizes at Hogwarts are neither too big nor too small.